The most important legacy of the Great War was establishing the shape of twentieth century Europe and the Near East through the dissolution of the Austro-Hungarian, Russian and Ottoman Empires. But the most immediately apparent legacy was the extinction and ruin of millions of lives, virtually all of whom had nothing to do with the outbreak of the war or its final settlement. 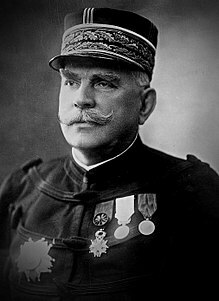 World War II, born to a great extent out of the First, would produce far more casualties, but the losses of the Great War seem more poignant inasmuch as they were suffered in an utterly pointless conflict waged, at least in France and Italy, in a frequently pointless manner. 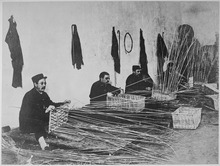 The world had never seen such a mobilization of men. On the Allied side: Russian Empire 12,000,000, British Empire 8,841,541, France 8,660,000, Italy 5,615,140, United States 4,743,826, Romania 1,234,000, Japan 800,00, Serbia 707,343, Belgium 380,000, Greece 250,000, Portugal 80,000 and Montenegro 50,000; a total of 42,959,850 men. 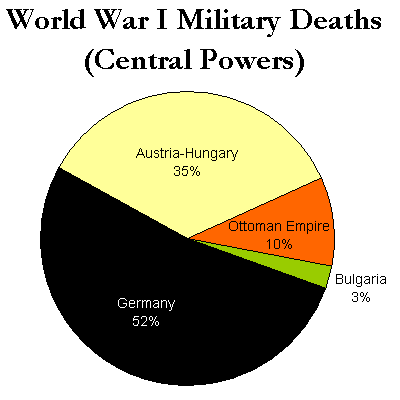 The Central Powers: Germany 13,250,000, Austro-Hungarian Empire 7,800,000, Ottoman Empire 2,998,321 and Bulgaria 1,200,000; a total of 25,248,321 men. 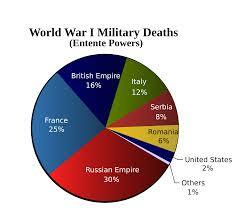 In the course of four years 75,208,171 men were under arms. An entire generation of young men were obliterated or maimed. (These figures vary a great deal.) 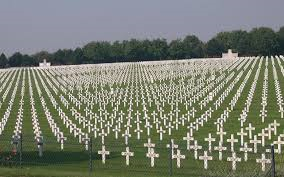 The Allied losses totaled 5,520,000 killed in action and 12,831,500 wounded in action, a total of 18,356,500 casualties; the Central Powers saw 4,386,000 killed and 8,388,000 wounded, a total of 12,774,000 casualties. The big losers: Germany with 2,050,897 dead, Russian Empire 1,811,000, France 1,397,000, Austro-Hungarian Empire 1,200,000, British Empire 1,114,914; actually, as percentage of population the biggest losers were the Serbians at an astounding 17-28%, the Turks at 13-15% and the Romanians at 8-9%. 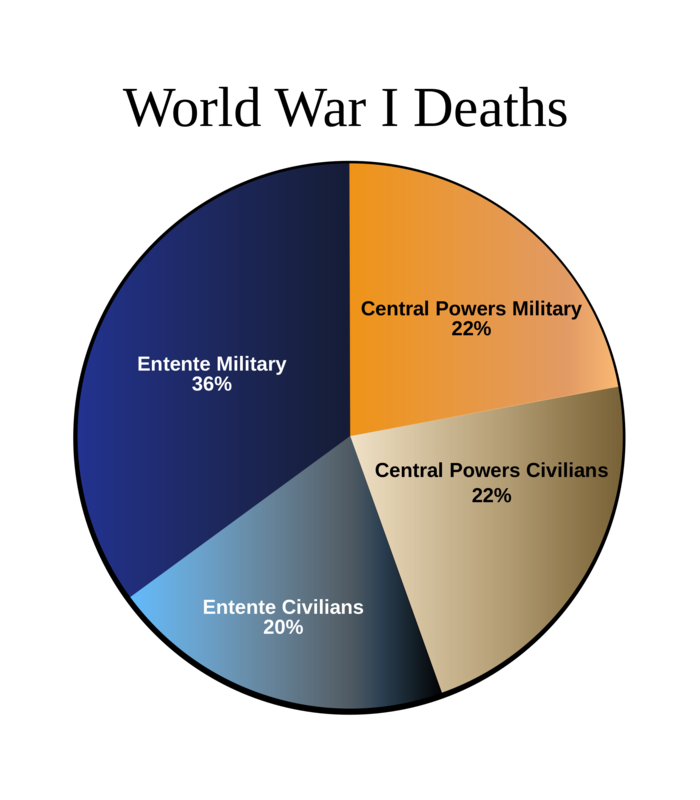 Add to all this 4,000,000 civilian deaths on the Allied side and 3,700,000 on the side of the Central Powers (including perhaps 1,500,000 Armenians). 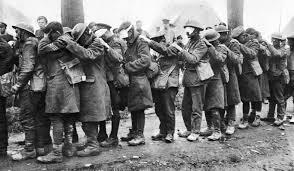 In all, about 17,593,000 died in the Great War; millions more would die in the Russian Civil War and resulting famine in the Ukraine (not to mention a natural cause – the influenza pandemic). 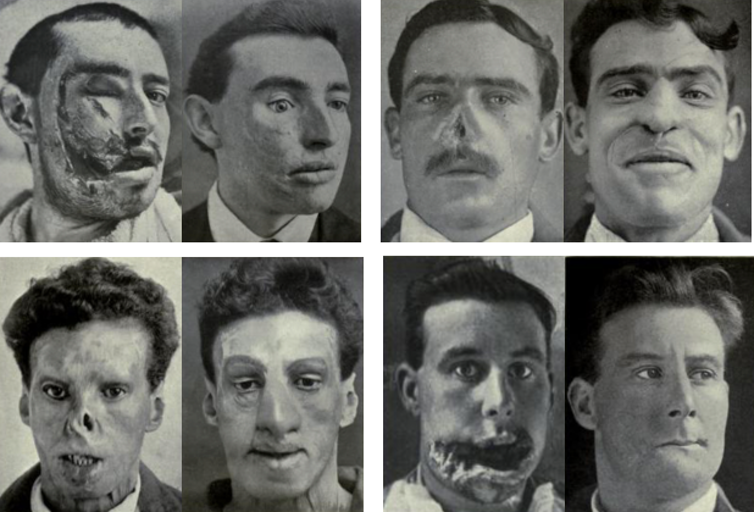 More than 21,000,000 were wounded in the Great War, and Europe was now filled with men missing limbs, jaws and eyes, men with corrupted lungs and men with damaged minds. 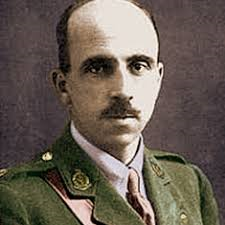 In fact, British army surgeons, led by Harold Gillies, undertook more than 11,000 reconstructive operations, mostly for facial damage, and Gillies was later recognized as the father of plastic surgery. 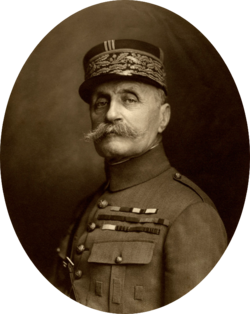 For the common soldiery the Great War meant lost years, wounds, death and perhaps a medal, but for the upper echelon of officers it meant in many cases career advancement and sundry honors. 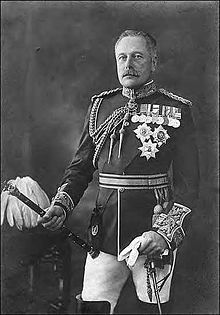 Joseph Joffre and Ferdinand Foch, for example, were made Marshals of France, and Douglas Haig received, among other honors, the thanks of Parliament, an earldom, and a grant of £100,000. I expect the poilus and Tommies were delighted by such awards to their noble commanders.